You may have noticed that we've been celebrating the World Cup by cooking lots of Brazilian food. There's plenty more to come before the tournament is over, but today I'm traversing Latin America to bring you THE BEST corn on the cob you'll ever eat. Elotes (corncobs) are a popular Mexican street food, smothered with mayonnaise, chilli, lime, and cotija, a firm cow's-milk cheese. They're commonly grilled unshucked, the husk pulled down to form a handy stick once the corn is cooked. But I've used shucked corn here, because corncobs with the husk intact would need to be soaked for about 30 minutes before cooking, and I just couldn't wait for deliciousness. Cotija is hard to get hold of, so use parmesan or feta in its place. I went with parmesan, and it was dreamy. 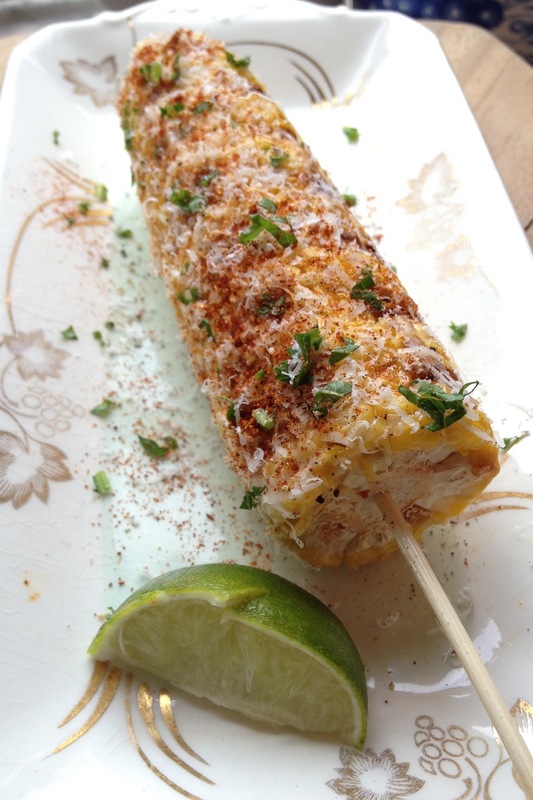 Try corn on the cob like this, and you'll never go back to plain ol' butter. Preheat the grill to its highest setting. I used my George Foreman, but a normal grill or a barbecue are both fine. Coat the corncobs in a little oil, then stick 'em on or under the grill for about 15 minutes, turning frequently. When they start to look ever-so-slightly charred, they're done. Remove from the grill and, protecting your hand with a clean tea towel or similar, push a wooden skewer into the end of each. Using the back of a spoon, coat one cob with half the mayo. Sprinkle half the cheese, paprika, cayenne, and coriander over the top, making sure every corny surface is covered. Repeat with the second cob. Serve with a lime wedge on the side, squeezing the juice all over before tucking in.